And, while the Stepmother (Marie-Claire D’Lyse) is indeed very mean, she’s also very funny, especially when she gets stinking drunk and passes out at the ball. And one of the stepsisters, Clementine (Dores Andre), is actually pretty decent at heart, if a bit clumsy and short-sighted (the glasses are a nice touch). Vanessa Zahorian’s thoroughly nasty Edwina makes up for her sister’s failings, though, don’t you worry (Zahorian is slated to dance the title role later in the run). 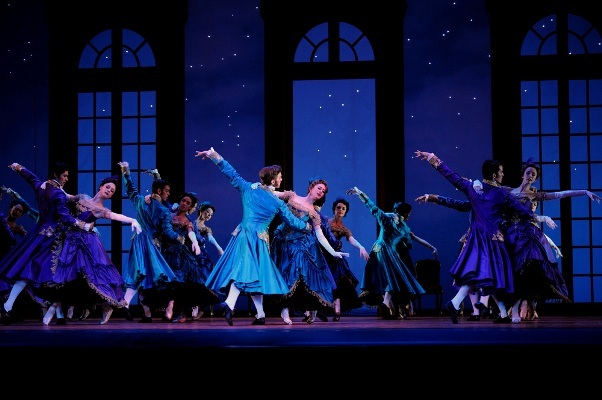 The most visible addition to playwright Lucas’ (“Light in the Piazza,” “Prelude to a Kiss”) version, however, is an extra character, the Prince’s best friend, son to the butler, danced on May 4 by Taras Dimitro. Benjamin, the buddy, has a mischievous streak as wide as the palace ballroom, which makes the Prince a lot more fun than usual, as well as a crush on stepsister Clementine, which affords a nice romantic symmetry at the end. All told, this is a “Cinderella” that exceeds expectations, which were high for this 11-performance season closer for San Francisco Ballet; one that will showcase almost every principal dancer in the troupe before the run ends. On May 4, Cinderella and her Prince were danced by Yuan Yuan Tan (who was wonderfully waif-like in the kitchen, quicksilver in a lovely forest scene where she is taught to dance by spirits and dryads and gnomes and really regal in the ballroom) and Luke Ingham, who brought a boyish exuberance to his role. Together, they seemed to float on top of that lovely Prokofiev score. But with all of its embellishments — fabulous scenic and costume design by Julian Crouch, lights to go with it by Natasha Katz (there are 51 separate chandeliers in the ballroom scene) and projections by Daniel Brodie — it’s still Wheeldon’s show. The former New York City Ballet dancer-turned-choreographer has a language to his steps and sequences that is fresh, a little quirky and downright hilarious at times. He is not afraid to let his dancers fall down, bump into each other or pass out cold for a laugh. Yet passion and lyricism are there when called for. This may be the definitive “Cinderella” for the ages. I doubt that even a fairy godmother could conjure up one that was more enjoyable.